My Canadian background is Acadian (French, on the East Coast of Canada) and I’m thrilled to be able to form a duo with my cousin, the Acadian song pianist Carl Philippe Gionet. We always have a blast together, both outside and in the practice studio, having collaborated many times over the years: most recently on a French themed programme in New Brunswick for Le Festival Acadien. Our programme revolves around the painting by Manet ‘La Musique aux Tuileries’, which I was fortunate enough to view recently at Manet’s portraiture exhibit at the Royal College of Art in London. I was inspired by the way painters, writers, and musicians in Paris, during the later part of the 19th century, all knew each other in this period of heightened artistic output. 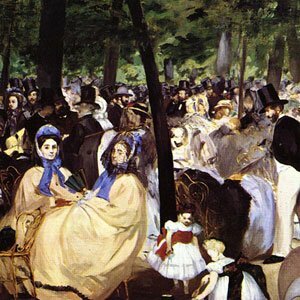 ‘La Musique aux Tuileries’ portrays this wonderfully, as the painting not only features a self portrait of Manet himself, but also the composer Offenbach, and poets Gautier and Baudelaire, amongst many others. Our recital programme features music by Offenbach, as well as songs set to poems by Gautier and Baudelaire, by the composers Hahn and Berlioz. We expand on the concept by also programming La Courte Paille by Poulenc, set to poems by ‏Carȇme. We thought this was an interesting connection, as Rue de ‏Carȇme in Paris is very close to the Tuileries Gardens! The programme culminates in Berlioz’s ‘Les Nuits d’Été’, set to poems by Gautier. We have updated the program for two performances in Toronto scheduled for the fall of 2016, at the Arts & Letters Club and Walter Hall. Rarely performed songs by Offenbach open the recital, followed by songs set to poems by Baudelaire, by the French composers Debussy, Charpentier, Duparc and Bizet. The first half concludes with a stunning song cycle, ‘The Living Spectacle’ by Canadian composer Erik Ross. The work is set to poems by Baudelaire, translated into english by Roy Campbell. The second half of our programme features again a performance of Berlioz’s ‘Les Nuits d’Été’, set to poems by Gautier.